As I've hinted a few times during the past month, in 2017 and 2018 I made three $50,000 investments in start-up companies. I dabbled in “angel investing”. Early last year, I made a third investment. I have a friend who is whip-smart and ultra-successful. She's started a couple of profitable companies in the past. She and her husband thought they had a great idea for a third, and although this particular concept was outside my area of expertise, I agreed to invest $50,000 in their company. Well, things didn't go well. The company failed. I was afraid that with that failure, I'd lost all of my money. Fortunately, I hadn't. Earlier this month, I received a wire transfer for $34,869.73. After transferring $5000 to my business account (to help pay bills for this site! ), I'm left with about $30,000 that I'd like to sock away somewhere that pays more than pennies. But where? Based on reader feedback from that article — over 1000 responses! — I opened an online savings account with ING Direct. They didn't have the best interest rates the time, but their rates were very good and GRS readers loved them. As you can see, I'm earning 0.99% on my money. That's a lot compared to, say, a standard savings account at a brick-and-mortar bank. (I was mortified to learn recently that the family business has over $200,000 earning only 0.01% at a major national bank. Holy cats!) But 0.99% seems low for an online savings account. It's certainly not the best interest rate that's out there. The company that used to own this website — with whom I still have a business relationship — has a handy tool that allows folks to look at a lot of today's top online savings accounts. Naturally, this is going to be a starting point for my search. Those rates are much better than my current 0.99% interest rate at Capital One 360. But I don't know anything about these banks (except HSBC). I haven't heard personal reviews from friends, colleagues, or readers. Plus, I don't know if these are the best interest rates available. I want to use this $30,000 to fund the next few months of my life. (I'd love to say that this money will last me a year, but it'll be more like six to nine months.) And now that I'm working again, I'd like to explore various saving options. Naturally, I'm going to conduct research of my own. Most of my colleagues maintain lists of current bank rates. I'll do a deep Google dive to discover more obscure banks and credit unions. I'll investigate those “fusion” accounts that pay high interest rates if you jump through hoops. My girlfriend is a huge fan of Ally Bank, and she proselytizes for them whenever she can. (I am not joking.) I see they're currently offering a 2.30% 11-month no-penalty certificate of deposit. (Their savings account interest rate is 2.20%.) I'll certainly check them out, but in the meantime I'm polling the GRS community. I have no doubt that many of you money bosses actively watch bank rates and features. I suspect you have favorite online savings accounts. Or money market accounts. Or certificates of deposit. Or whatever. I'm hoping you can help me! Based on your responses here (plus the responses I get on Twitter, in the GRS Facebook community, and from the GRS email list), I'll look at a variety of different options. And have no fear. I'll report back in a week or two to share my decision and I'll collate a list of the best savings accounts according to you folks. 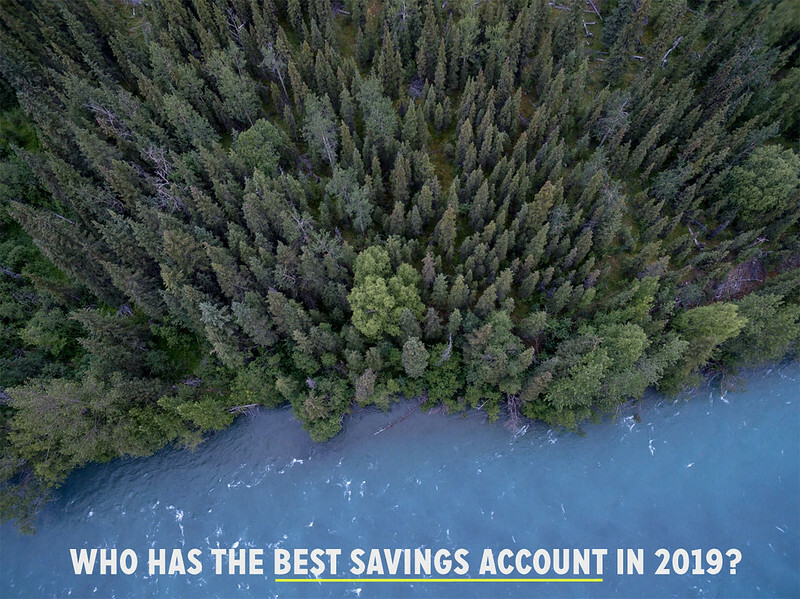 There are 107 reader responses to "Who has the best savings account in 2019?". Ally Bank has always worked wonders for me. Clear about the interest I earn, always great interest rates (I joined when it was 1.05%! ), no fees. No complaints. The whole family uses them. Yes! I have used Ally since 2009. Their current online savings accounts give 2.2% I currently have my emergency savings in their No Penalty CD which is giving 2.3% and you can close the account any time after the first 6 days without penalty. I usually cycle between the no penalty CD and the savings account based on which is offering a higher yield. Agreed Ally is great! They also keep increasing the interest rate for the savings accounts. They are really responsive on the phone and/or chat if you need to reach them. They don’t have a physical bank location, but that has never been issue for me. Alliant Credit Union is that a comparably high rate and regularly increases their rates to match the market. I’m also a former ING Direct customer, from back when their interest rate was over 6% (that was probably 15 years ago, when the big banks were only offering 2.25%, if that). I stayed on after the transition to Capital One, but when interest rates started to fall all over, I started looking around and comparing other online alternatives and discovered Ally Bank. Back then, they were part of GM Financial, although now I believe they’re an independent entity. Their online savings interest rates were always at or near the best on the market, with few restrictions or minimum deposit. 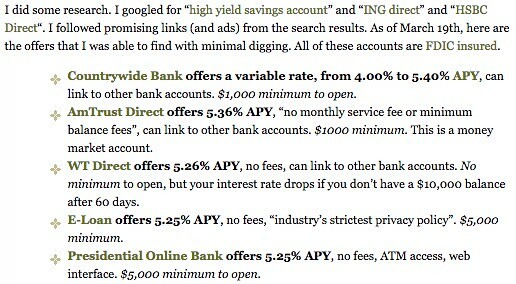 A couple years ago, Ally started offering checking account services, which also earns interest (albeit a tiny o.10%). The big advantage of using Ally’s checking and savings, besides the interest and compared to my previous experience with ING/CapitalOne, is that transfers between the two accounts is instantaneous, which means I can keep the bulk of my money in the savings account (earning higher interest), and then instantly transfer funds to the checking account in an emergency. When my primary checking account was with Wells Fargo, transfers from Ally savings to Wells Fargo checking took at least 2 to 3 days, which sometimes required a little advanced planning. So, in conclusion, I’m in complete agreement with your girlfriend. I’ve been a happy Ally Bank customer for more than 10 years. Quick question. I have been with ING Direct/Capital One for a long time as well. The thing I like is i can have as many different savings accounts as I want, essentially each account is an envelope for monthly budgeting for my different bills. Can you do that with Ally? Yes. You can open multiple saving accounts with Ally. It works just like Capital One 360 in that respect. I want to use this $30,000 to fund the next few months of my life. — I take it then that you’ll be needing to make withdrawals sorta frequently? If so, then a money market acct with check writing/withdrawal privileges, probably 3-6 times a month. But there’s the rub. You’re going to be drawing down on the total and once you reach their break point then % goes way down. Some will even hit you with fees. Grrr.. And even better yet, some make you keep it in there for X number of months before said % kicks in. Just my 2 cents worth but what about not using it at all for living/business expenses? Put it into your emergency fund and let it sit there for a the same length of time. If you really need it then, sure, pull it out, but if not, then, make a decision after the said time line. The % really doesn’t matter in such a short time frame. So does the headache & time spent researching this equal the small interest you will earn? I recently sent through the same exercise and discovered that buying tbills was a much better proposition than putting money in a savings account. Not only are the rates higher but interests are state and local tax exempt. Building a tbills ladder was very easy. Ive tried CIT and Ally, hated CIT (I’ve taken my money out and am trying to close my account) but love Ally. Not the highest rate out there but I’m ok giving up 0.2% in order to sleep soundly at night. Wholeheartedly endorse Ally Bank. Not always the top interest rate, but very close and great CD options. I started with CapOne 360 for the ease of setting up sub-accounts to track different goals but switched most of my savings to Ally and haven’t looked back. We’ve been very happy with Alliant Credit Union. Rates for savings are currently ~2%. The site is well-designed and easy to use, as is their accompanying phone app. It’s also simple to open multiple savings accounts for various purposes – I think we currently have 10 or 12. ATM fees are reimbursed and rates for CD have been competitive as well. Waiting for the no-fee online broker Robinhood to begin offering their savings account. FDIC insured and they are promoting a 3% rate. They are new to savings accounts but been around a few years for simple fee-free trading. Not promoted on the website, but as an existing user, I got a promotional email that it was coming. I stopped chasing the highest online savings account interest rate a while ago. I stick with reliable Ally Bank; they may not have the highest rate, but they tend to be consistently competitive. They currently have a 2.2% APY. While Ally is the home base for my cash savings, I’ll occasionally transfer those funds to take advantage of checking account bonuses that offer $200-$600 for meeting specific goals. Doctor of Credit is a good place to find those offers. I’m another vote for Ally Bank! I’ve never had a problem transferring money in or out, and their site has always worked reliably for me. Capital One has a ‘360 money market’ account, which is at 2% right now. I don’t really understand the difference between it and the regular savings account (maybe it has a higher minimum, or more restrictions on transactions?). I switched over last summer (after kicking myself for not looking into it sooner! ), and even got a $200 bonus for doing it. Actually, the Capital One 360 Money Market is a different product than the 360 savings. You need to open a new account, then link, then transfer the money over. As others have stated, the 360 Money Market earns 2.00% APY. I’ve been very happy with Capital One including speed of transfers, security, their mobile app stability (iOS) and rate. Despite the “money market” name, that account is FDIC insured. i was getting ready to say the same thing. (I never worked there however). 1) I really like credit unions in principle and want to support them. 3)The checking account gets you 0.65% APY which is one of the highest rates I’ve seen for checking. 4) On the rare occasions when I need to withdraw cash I’m always stuck using a random ATM (almost never one from a bank I use). Alliant automatically rebates ATM fees on its debit card. 5) I’ve deposited checks multiple times online- worked seamlessly. I was able to find a 2.9% one-year CD with Sallie Mae this month. I’ve found that the savings accounts interest rates at most banks are so tiny it’s almost not worth considering. Amex is at 2.1%. I like their savings account because I have credit cards with them. I do the same with Discover. I’ll trade the optimization of always having the highest rate for having my account structures simplified. Good rates, good options for CDs if I ever choose to go in that direction, solid customer service. As Evelyn noted above, Cap One has two different accounts, one with a higher rate. I hate Cap One (it’s my regular bank too), but I have some money sitting there until after taxes. I’ve had an account with Ally Bank for years, and I like dealing with them. Everything is straightforward and works. 10+ years ago, I had an account with HSBC, which had the highest rates at the time. They were hard to deal with, and any communications regarding changes in terms were poorly written and confusing. Echoing earlier comments, I use Ally Bank savings and checking.I only keep a minimal amount in the checking (~$500) and it is mainly for when I’m in need of cash. Doesn’t matter what bank atm I use, they always reimbursed me at the end of the month. There is a limit per month (forget is it based on amount or number of times). I use Synchrony Bank. The online tools are basic, but work well. When I opened the account several years ago, their High Yield Savings account rate was the best around and remains competitive (2.20% currently). I recently set up a CD ladder with them as well. Best rates I’ve seen (2.75%-3.1%) and only $2k required to open. Ditto on Synchrony Bank. I’ve used them for years – haven’t taken the steps to switch to a CD ladder but know that I should. I especially like that I don’t get a sales emails or contact from them outside of my account. I was tempted by Goldman Sachs Marcus products – running at 2.25% for online savings, 2.75-3.15% for CDs but I’ve liked just the “set it and forget it” of my Synchrony account. I also use Synchrony. They raise their rates and they stay in the highest available. I agree with Dave, Anne and TJ about Synchrony. I’ve had a savings account and several CDs with them for about 4 years and previous to them at ING Direct/Capital One 360. Synchrony is user friendly and easy to call a rep on the phone if needed. They also offer IRA CDs which I also take advantage of. Another vote for Ally. I’ve been really happy with them and use them for everything. My ally bank account currently gives 2.18% interest and it seems it has been slowly going up the past year. I also joined when it was around 1%. This post just reminded me to transfer more out of my checking into that savings. Thanks! Free money! I recently opened a HSY with Marcus (Goldman Sachs) to squirrel away money for a sabbatical in a few years’ time. I think the current APY is 2.23%. You are limited to six transfers a month, which may not be ideal for everyone but is plenty for my needs. Their website is well-designed and linking to my Wells Fargo account was seamless. I had tried opening an account with Synchrony but if I remember correctly you have to be a U.S. citizen, so I wasn’t able to. Similarly, I abandoned my attempt to open an account with Barclays after they asked me to provide a copy of my SSN and my driver’s license – apparently not an unusual request for them, but not something I felt comfortable emailing, especially not to “[email protected]”. I have been with Marcus for several years and I like them. 2.25% now. Also, purchase 4 week T Bills via Treasury Direct – they make it very easy to do these days! Checking accounts advertised at 3% APY. I haven’t used it personally, but their website is fantastic (if you’re definition of “fantastic” is a bit loosely based). I have been pleased with Discover Bank. Their savings rates are currently 2.10% with a one year CD at 2.65%. Customer service has generally gone above and beyond as well. +1 for Discover Bank. I have been using them for years. Immediate cash needs I keep at my big bank and emergency savings go into the Discover account. I’ve also been with Discover Bank for a long time and they seem to have competitive rates. Yep +1 for Discover. Have their credit card for many years and last year opened checking and savings. Savings is nice since you can have up to 6 savings accounts. Easy bill pay and transfers between accounts and institutions. Only thing that I don’t like is when then mail a check they do not take out the funds or make the check amount unavailable from the balance. Other than that, it makes life very easy. I’ll add Discover Bank’s online savings account, currently at 2.10% (I believe). Single log-in for both my Discover CCard & this account. I’m a long time lurker. Thanks! I have three accounts with Barclays and they are fantastic. The online tools are easy to use, you can deposit checks by photo straight from the mobile app (this is a relatively new feature for Barclays as the US bank did not have a mobile app until about a year ago), and they seem to be at the vanguard of rates. I’m with Tom about Amex. It’s a company I know and with whom I have a long, amiable relationship credit card-wise. Rates aren’t at the top, but near the top. Website is simple but they keep making improvements on it, and it does the job. Although they’re technically different sites, after linking credit and savings accounts it’s easy to flip between one and the other during regular checkups, too. I use and like Barclay’s. They are at 2.20% right now. Seems to increase ever other month right now. I’m sure most of these savings accounts are pretty similar so you will probably be safe in just about any of them! I love Simple bank (simple.com). It’s a no-fees-ever online checking account with built-in envelope budgeting for goals and expenses (you can automate everything!) with a 2.02% APY for any money you put into the savings goal. It’s essentially one account the divides out everything the way you need it to be so you know exactly where you are and stay on track. My favorite part is that it alerts me every time money moves in or out and I don’t have to wonder if that investment pull or utility bill put me over budget as it shows that it pulled from it’s specific expense bucket that was already funded for that pull. It has changed the way I manage money and beats everything I’ve done in the past. It probably isn’t ideal if you just want the money to sit and get the highest interest out there, but I can’t help but recommend it. Have not used Simple, but have heard great things about it from a couple friends. They like the communication and the ability to move money in and out of the 2.02% APY bucket. Yep. That’s on my list to browse! Thanks! Check out money market rates at Vanguard. Prime Money Market is currently yielding 2.5%. For an online bank, Ally would be my #1 choice. I’d go with Vanguard if you already have an account with them. The rate is pretty good and it’s convenient enough. Why open another account when you don’t have to? I recently went through a similar exercise. In the end I didn’t want to open another account. I use Schwab for my aftertax investments. They offer a “purchased money fund” SWVXX that is currently paying about 2.3%. It is easy to buy and sell and transfer to my credit union. I imagine vanguard and fidelity offer something similar. As far as I know, I think Schwab accounts still have no fees at overseas ATMs so a good one for frequent travelers. I’ve also got money parked in SWVXX. In my case it’s earmarked for an upcoming tuition payment. When the payment is due, I’ll sell the necessary shares, and transfer it to my bank account from which I’ll make the payment. If you want to optimize rate, PNC is currently offering 2.4% APY in their complicated “virtual wallet” savings account structure if you make 5 debit purchase per month or have a “direct deposit” of $5k or more per month. Not sure if they have the same rate for standalone savings. There’s also an account opening bonus. I researched this a lot when I got a windfall last year too and instead of chasing the online savings accounts which are always trying to out-do each other I felt that the Vanguard Prime Money Market seemed to be the best route for me at this time. It’s at 2.5% right now and seems to be increasing every other day. It’s not FDIC, but I do have a lot of faith in Vanguard and their philosophy to trust they’ll be fine. Like others have said, I already have other accounts with them and I try to keep my finances simpler if possible so it’s nice to have it in the same place as my retirement accounts. I have good experience with both Synchrony Bank & Marcus (Goldman Sachs Bank). Easy to open account, easy access and competitive interest rates. Also, reading the comments it might be good to have an article on FDIC savings accounts vs. non-FDIC money markets and what really is the difference in risk. Money markets have a very good track record, there’s so much money in them that a run on them is disastrous enough to de-stabilize the economy. In 2008, I believe it was just one money market (out of hundreds? thousands?) that “broke the buck” after Lehman collapsed and the US government quickly swooped in to announce a money market insurance plan to prevent a ripple effect. So even though money markets are not officially FDIC insured the chance of the government allowing them to drop in value is near zero, about the same chance of the US government FDIC program failing. I keep my “loose cash” in my brokerage money market account at Vanguard (VMMXX). They are currently paying 2.47%. It’s an easy transfer from there to my WF checking account whenever I need to beef up the balance of my checking account. I know it’s not FDIC insured, but I don’t keep more than $5-10k at a time in it. I think the question here is the best combination of interest rate and liquidity (that’s sort of always the question, I suppose). We have our “medium-term” savings in AMEX High Yield Savings. We’re getting a solid 2.1% right now, 6 withdrawals limit per month, FDIC insured, but for the interest rate I prefer the liquidity vs a 6/12/18 month CD. I want to be able to take advantage of opportunities (like buying a house) where six months might be a little too long a horizon from the moment we make the decision. As a retail credit card company, AMEX has solid technology with about all the functionality we need (external bank-linking, security, reminders, automated transfers, etc.). Its also a big company with a long track record that I wouldn’t fear for in the wake of any potential, major financial crisis of the future. A second option I need to look into further for myself would be this new SOFI checking account I got some marketing material on, since i had previously consolidated my student loans through them. They offer all the standard no-fee checking bells and whistles (P2P transfers, mobile app,etc. ), plus 100% ATM reimbursement, no foreign transaction fee… WITH OVER 1% interest. that’s a lot less than the 2%+ on the savings accounts, but its a true day-to-day checking account. I think that warrants an investigation for a checking/savings combo…. I mean, Ally has those cookies at FinCon… so there’s that. I signed up for ING when you recommended them years ago, JD! It was a great recommendation. Too bad Capital One took them over. I just recently became fed up with my Capital One 360 account and transferred all money out. Regardless of which option you choose, its good to figure out how your “payment flow” will work with the account. Are you going to make a transfer to a checking account to pay bills? My first choice in that situation would also be Vanguard’s Money Market account, if I had money with Vanguard. Although, an advantage of a bank’s savings account is being able to pay some credit cards directly. I actually set up as many automatic credit card payments as I can directly from a savings account- I like it because there is always more of a “cushion” in savings so I don’t have to keep a close watch on whether automatic credit card payments will overdraw the account. American Express, Barclays, and US Bank allow cc auto payment out of savings (but not money market accounts, I don’t think.) Chase and Citi don’t. The bank I am using now is a Kasasa rewards checking/savings combo in my local city: First Utah Bank, which gives 2.5% on your savings balance, if you also have a companion checking account with 12 debit card withdrawals per month. The nice thing is that the debit withdrawals also have a 3% reward! Its really pretty awesome, although if it weren’t local, I probably wouldn’t have done it. I went with 28 day T-bills for my emergency/house funds. Divided it into fourths and set it to reinvest every week. The rate does fluctuate of course. If I do need it, I know 25% will free up every week for the four weeks. Isn’t ALLY bank the former GMAC? Ally. I’ve used them for almost a decade I think and they consistently raise rates quickly to adapt to market interest rates. Customer Service has been great and you ring in directly to a person instead of a menu tree–at least the last time I called which may have been a year or more ago. I’ve been very happy with Barclays for a number of years now. I started using Sallie Mae bank when my kids got into college 8 years ago. I figured I would establish a relationship if I ever needed to borrow money for college and I could say I am with your bank. I never need to use them other than transfer money for college expense and I have never had a complaint. At 2.2% compounded daily paid monthly they are competitive with just about anyone out there and I never here anyone mention them…. I am not sure why….. Probably because they are not part of the top of SEO that most bank optimize. Ally has worked for us. They continually raise their interest rate about a month after the Fed raises rates. They are a little behind Vanguards prime money market fund (where we also have cash) but it’s FDIC insured so that’s worth something. I would love to hear about how to “do” T bills. For math sake, I keep to a brick and morter for my “current” bills. I could make $350 more in a year by going with the former GMAC. Yes, they are probably OK- but once burned…. My credit union offers 1.2% on savings and .9% on checking. I am a keep it local person- credit unions, foods, clothing. It is a limited amount of my portfolio. I am doing that right now. Treasurydirect.gov. You open an account and either put money into the C of I account or direct withdraw from your bank. Increments are in $100 ( nothing in between) maturity of 4,13,26 and 52 weeks for T-bills and 2,3,5,7 years for t-notes. I am currently building a 3 year ladder of 3 year notes paying once a month. Add another vote for Discover Bank! Not the highest rate available, but they are keeping up with the leaders at 2.1%. I opened an account a couple years ago to stash my emergency fund. Unlike most of the other options available, they do offer a bonus for new customers based on the size of your initial account balance. $150 bonus for a $15,000+ deposit or $200 bonus for $25,000+. I will say that I haven’t made any additional deposits or withdrawals since I initially opened the account, so I can’t comment on fees or ease of transferring money in or out of the account. I can say the website layout, which they kept very simple, is easy to navigate. These are two excellent web sites that I really like. So far, I’ve had good experiences with CIT bank. Pays the best and allows me to move cash in and our easily. I second that! Best interest for a checking account out there currently. Can’t go wrong with 4% up to 30k! JD — you could stay with Capital One but move that money from savings to their Money Market Account (currently 2.0%). Also, I know you want to use this money, but their 1 year CD is currently offering 2.7%! Food for thought of you could split some between the two. Good luck! I was with ING Direct since the days of the > 5% rates (although in those days I didn’t have much to be making interest on), and everything (including their rates) went downhill when it became Capital One. Recently switched to Ally and super happy so far. I even opened accounts when they were doing a 1% bonus (up to $1,000) if you kept funds in there for a few months. My bonus (nearly maxed out) should be coming in a couple weeks. Plus I about doubled my interest rate. I couldn’t find any significant number of bad reviews on their online savings accounts (only on their mortgages). Synchrony Bank – Currently paying 2.2% on ANY balance, no fees, no gimmicks. I have all of my cash here and have for many years. I currently use Goldman Sach’s “Marcus” savings product. I’m earning 2.25% APY, and their accounts are all FDIC insured. Anytime I open a new online high interest savings account, I link it to the others I already have. When any of them stop being competitive, I simply transfer the cash to a higher earning one, but keep the older accounts open. My Capital One (former ING Direct) is still open, but has just $100 in it, and the bulk of my savings is currently with Citizens Access. Here’s a list of high yield savings accounts: http://www.yourfinances.com/best-high-yield-savings/ according to that, CIT offers 2.45% with no minimum. There are a few second ones at 2.35%. I opened savings accounts with ING Direct 10 years ago and stuck with them as they were sold to Capital One. This month, I finally got tired of waiting for Capital One to raise interest rates and moved to Ally Bank. So far, I’m very happy with Ally and the ability to open multiple savings accounts there. 2.20% interest is a huge increase from 1.0%! This was a helpful thread for me to read, as I’ve recently opened an account at Ally. For a long time now, I’ve banked at Chase (yeah, ugh! ), but when all your credit cards and bills are on auto-pay, as well as deposits from paychecks, etc., it’s quite time consuming to switch banks. But, that is what I’m doing over the next 18 months. I’ve opened the Ally account and I’ll start switching over some accounts in the coming months. I’m so happy to read the many pro-Ally Bank comments here. I’ll be utterly free of Chase soon…. I adore Ally too. I switched to them from HSBC back in the day when their online savings rate eclipsed them and I’ve been super happy with them since. The only change I’ve made with them in the past 5 years is moving money from their money market to their savings (at one point their money market was higher than online savings for whatever reason… also, as long as my memory serves right). They do instant transfers, so there’s no reason you can’t have both and use the debit card associated with the money market to quickly and conveniently use your money that’s in your online savings account. I’ve been super happy with them. Their interface is easy, everything is straightforward, and I’m a sucker for their marketing campaign. Wait… you glossed over the most interesting part — how did you recoup 70% of your investment in a failed startup? That’s incredible! JD, have you ever spoken with Ken at depositaccounts.com? It seems to me you guys have some things in common. I’ve been an ING/Cap One customer for 10-11 years as well. Former ING customer, now with Barclays. Barclays has been great – you can open up to 5 accounts, and set up transfers that are monthly, semi-monthly and bi-weekly, which allows for easy transfers on paydays. Interface is easy, transfers are fast. No fees. No complaints. I tier things up. I keep a max of 10k in a high-yield checking account (Consumers Credit Union, 5.09% APY up to 10k), and then from there I stick any excess in IBonds or 5-year CDs with Ally Bank or CCU, whichever of those has the highest interest rate at the time. As long as it all beats inflation I’m happy. Really though, I’m not planning any big purchases within the next five years, so keeping more than 20k in liquid (or near-liquid, in the case of the bonds and CDs) is kinda meh. After 20k I’d start stuffing it into extra space in my retirement accounts, 529 for kids, or taxable stock/bond accounts. I switched to Ally Bank in November when they were offering a 1% bonus for all new money. I will be getting a $350 bonus on 2/15. I wasn’t sure this would be a long term bank for me but I love their website and communication. I have since opened 2 CDs at 2.75% and 2.85%. I think I will be a customer for a long time. One thing I used to love at ING Direct was that they showed how much total interest you were earning in real time – sort of like the National Debt clock but earnings not debt. Any chance we can get Ally to add that? Former ING Direct / Cap One – switched to Ally Bank when they were offering a 1% bonus for new money in November. $350 bonus will be deposited on 2/15. I love Ally’s website and have since opened 2 CDs – one at 2.75% and one at 2.85%. Ally Bank for me. I have a Savings account and CDs. I use Discover Bank and CIT Bank. CIT is really only good for long-term savings, but Discover may work for you — checking and savings. The savings account has a competitive interest rate, like Ally, but it’s usually never the highest. I stay with them for the checking. You get free paper checks, 1% cash back on debit purchases and lots of fee-free ATMs. I’ve always heard good things about Ally, but Discover has been great for me. I seriously just opened accounts at Ally Bank last night. I’m switching everything over from Capital One 360. I love Ally’s website and it’s so much more user friendly and laid out better than Capital One’s! The best savings account isn’t… it’s a Consumers Credit Union Free Rewards Checking. It pays up to 5.09% on balances up to $10,000. Yes, there are some hoops to jump through. I reach them easily as part of a normal month. I use the debit card at the beginning of the month to meet the qualifications. Then, I switch to the Visa card from the rest of the month. I also have any bill I can pay with a credit card autopay on the Visa. I earn $817 in interest last year. They have increased the interest rate since then but cut the balance that it’s paid on in half. On a side note, I made a Money Map last week. It was very useful when I found a fraudulent charge this week and had to cancel my credit card. I was able to see the automatic payments scheduled in the next couple days and change them to a different card until my new card arrives. I also had an ah-ha moment and decided to keep the funds for an expensive hobby separate from the rest of my funds. That realization led me to create a list of interest, cash back, and discounts. I’m hoping to use multiple things to increase savings. ING Direct was a pretty cool place to park your money – they had an independent flare to them – but it’s starting to get bank-ish now that it’s Capital One 360, kinda blending into the bank culture of their mothership. “Resistance is futile. You will be assimilated.” (I’ve used a credit union only for the past 25 years – it’s probably my bank phobia but I’m going to close the Capital One 360 account very soon.) So now I use American Express National Bank, with a 2.10% APY right now. Another favorite of mine is Vanguard’s Prime Money Market Fund with even better returns. This is the gateway for things like Balanced Index fund or any number of ETFs, all very low cost with competition-beating returns. Set it and forget it.